The "Yak Attack" Kayak Transport Boat at the dock. Loaded for bear ... well at least snook and tarpon! In the Barron River in Everglades City returning from a day's fishing. Capt. Wright with a nice 17lb snook before releasing her..
Chip Murray of Tampa Bay with a nice Goliath Grouper. Into the trout action ... "big time"!! Fred Woodward of TX, with a nice snook. Fly Fishing for Snook and Baby Tarpon. make an excellent fly fishing platform. .
EKF Guide Rich Jones led this anglers to another nice "black water" snook. There series should be titled - "The Many Faces of Rich Jones"
The man does catch fish!! EKF Guide, Capt. Jason Sine with a nice "bronze" redfish. Will H. from Indy with "Ol One Eye" that he wrestled from a creek! David "Wildman" Carr of Chokoloskee. Heading up the creek (with our paddles) to the tarpon lakes. Brian K from "Way North" on a "Chokoloskee Sleigh Ride"
EKF guide, Rich Jones led Marc to this nice redfish. Marc likes gag grouper as well. 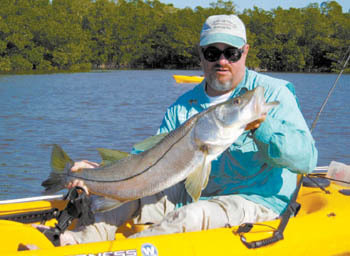 EKF Guide Rich Jones, with a nice snook.